Luangprabang River Lodge sits along the Mekong Riverside, enjoying quick and easy access to Luang Prabang’s attractions. It offers air-conditioned rooms, a tour desk, and free Wi-Fi throughout the hotel. Rooms at Luangprabang River Lodge feature wooden furniture and flooring. Each room has cable TV, a fan, and a private bathroom. Some rooms offer views of the Mekong River. The hotel provides the convenience of a 24-hour front desk. Laundry service and bicycle or car rental are available. Breakfast is served daily in an outdoor setting. Guests can have light snacks at the courtyard café while enjoying street views. 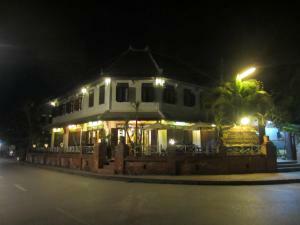 Luangprabang River Lodge is situated on lively Sethathilath Road, just 5 minutes’ walk from the Hmong Night Market. The Royal Palace Museum is 1 kilometre away.